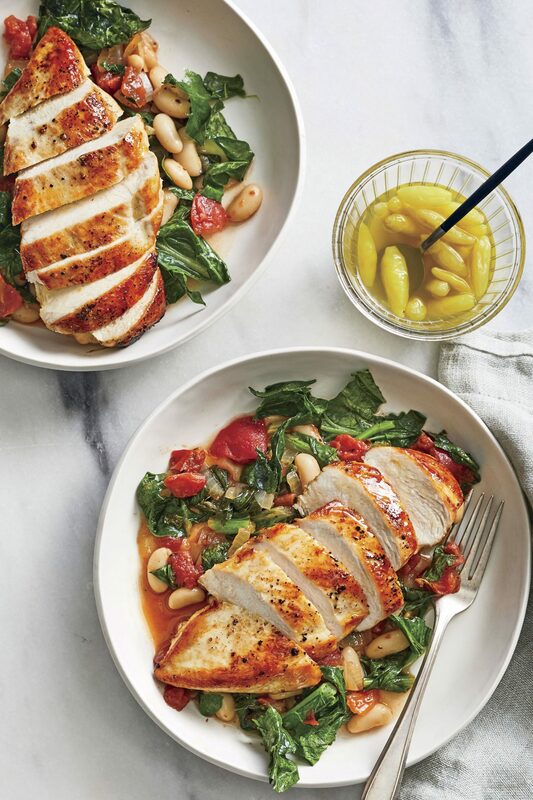 Simplify weeknight meal planning with these hearty chicken recipes that offer a complete meal in one dish. 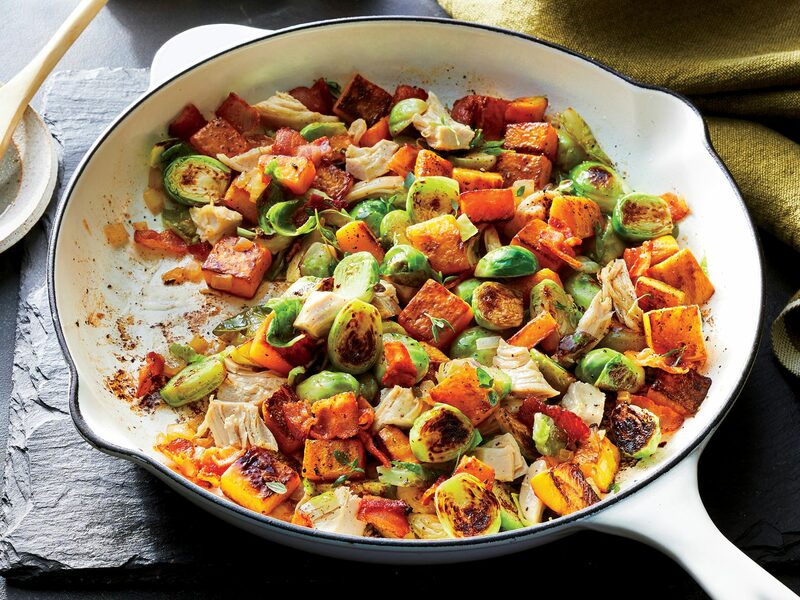 Use your cast iron skillet to make this bright and flavorful dish. We recommend serving this chicken and carrot dish over mashed potatoes so that not one drop of broth goes to waste. Gnocchi will quickly become your new favorite. Unlike noodles, prepared gnocchi can go directly into the pan for a super fast dinner. Using chicken rather than beef in this classic dish is a total win. It's less expensive and just as rich and satisfying. Rather than boiling the noodles in a separate pot, cook them with the chicken stock and other ingredients. The starch from the pasta thickens the broth, making a surprisingly rich sauce without butter or cream. Give the large bone-in breasts a head start in the oven so they will be perfectly cooked by the time the vegetables are done. You'll want to drain the liquid from the pan before adding the vegetables so they can caramelize evenly. Cumin, saffron, and oregano season rich chicken thighs and nutty farro as the dish simmers. 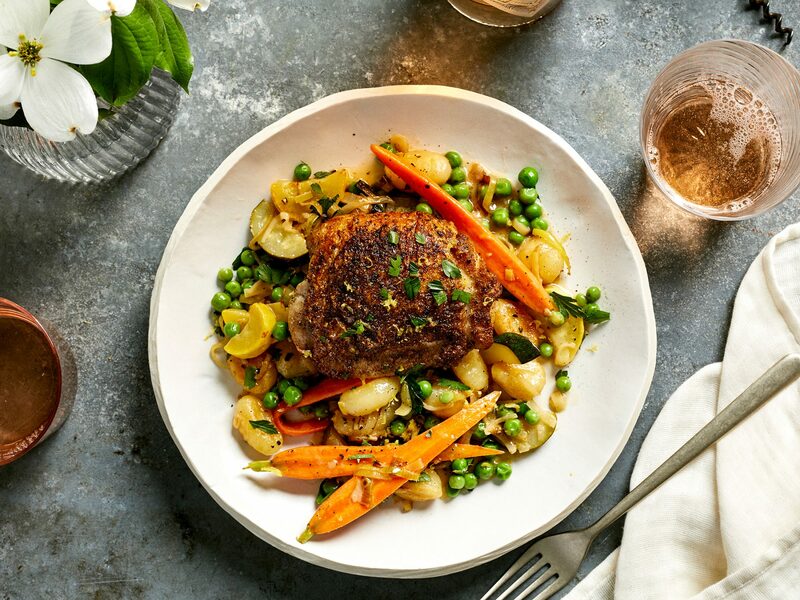 This chicken dinner uses the French technique of braising chicken in white wine. Then, a sauce is created by reducing the juices and thickening them with egg yolks and crème fraîche. Once it's cooked, the parsley root is tender yet firm. Hailing from an era when casseroles were king, this Tex-Mex dish still reigns supreme at church suppers and neighborhood potlucks. Swirl your fork around a 1980's Southern casserole. This classic one dish wonder gives us all the warm and fuzzy memories we were craving. This rustic one-pot meal, a company's-coming riff on the old-school chicken-and-rice number, is held together by a tangy gravy flavored with country ham and mushrooms. Nutty wild rice helps sop up all the good chicken gravy. 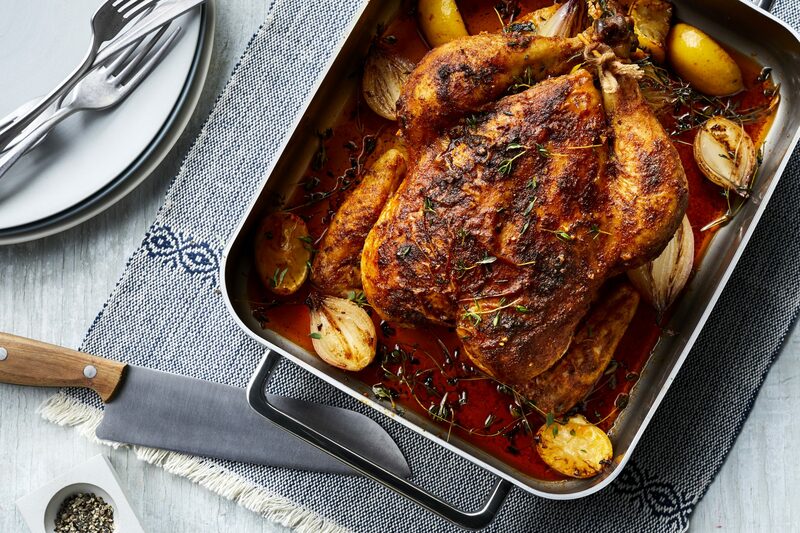 Nicknamed "Anytime Chicken" by Test Kitchen Specialist Vanessa McNeil Rocchio, this winner of a chicken dinner is our new favorite roasting-pan supper for weeknights or easy entertaining with friends. Jambalaya is a classic Creole dish that combines rice with a variety of other ingredients such as tomatoes, onions, peppers and some type of meat or shellfish. This easy one-dish meal features both smoked sausage and shredded rotisserie chicken. All the flavors of a favorite casserole come together in the comfort of mac and cheese. Serve King Ranch Chicken Mac and Cheese to your family, and it will become a quick favorite. Zucchini, potatoes, and carrots are all included in this hearty, one-dish chicken meal. Chicken, Rice, and Parmesan Skillet is perfect for a sunny weekend al fresco lunch or dinner—and it's ready in just 20 minutes. Cutting the chicken into pieces before roasting speeds up the cooking time of this sweet and savory dish. Various adaptations of this popular recipe from the Silver Palate Cookbook have been a go-to dinner party favorite for decades. It's a simple and delicious one-dish recipe for the busy host, and tastes best when prepared a day or two ahead. No rolling pin is needed for Skillet Chicken Pot Pie. Refrigerated pie crusts give you a leg up in the preparation of this classic comfort dish. This simple Black Bean and Chicken Casserole uses a slow cooker, canned beans and rotisserie chicken to make a super-convenient family meal. 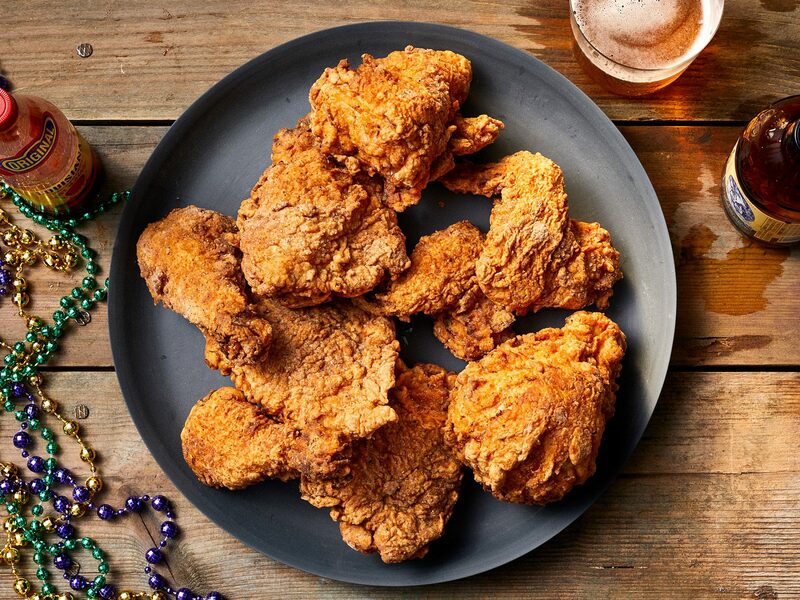 Falling-off-the-bone tender is what you get when you simmer chicken pieces in a liquid mixture of wine and broth along with herbs and fresh vegetables. Everything cooks together in a Dutch overn for a hearty one-dish dinner. 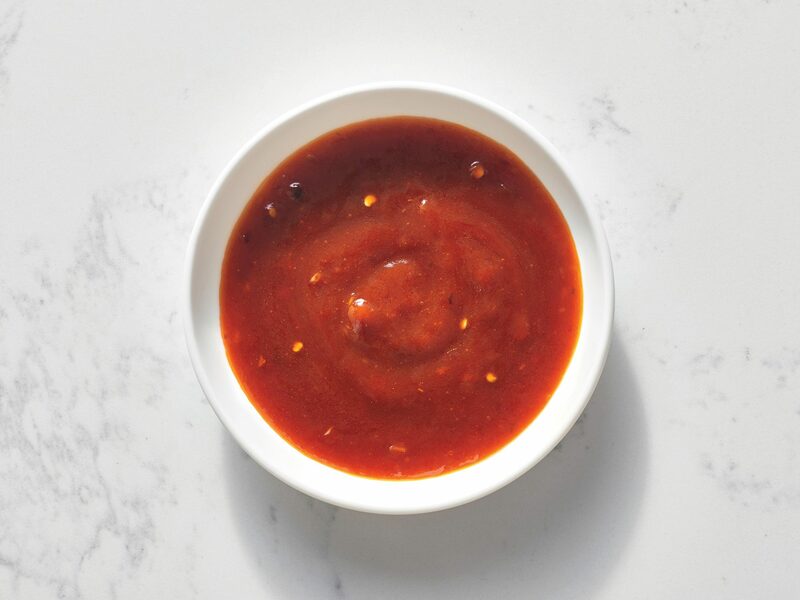 Simmer seasoned chicken breast pieces, veggies, and rice together in a tomato and wine-based sauce for a flavorful and low-fat one-dish meal. Top the finished dish with chopped olives for a Spanish flair. This easy chicken and shrimp paella is a great way to offer traditional Spanish cuisine for a casual weeknight dinner. Make a savory cobbler for supper by topping a creamy chicken and broccoli mixture with buttered sourdough bread cubes and baking in individual baking dishes or a 2-quart baking dish. Take your tired chicken tetrazzini recipe up a notch by adding the rich flavor of Marsala, chopped prosciutto and baby green peas. Satisfy picky kids and hard-to-please husbands with this hearty chicken casserole. The flavors are similar to enchiladas, but you don't have to spend the time filling the tortillas. Stock your freezer with this delicious kid-friendly recipe that makes two casseroles. Eat one for dinner and save the other in the freezer for a make-ahead weeknight dinner. Pomegranate molasses, a staple ingredient in the Eastern Mediterranean, gives this one-pot dish a delectable tang. Cleanup is easy with this one pan dinner (you'll make the sauce in the same pan you used to cook the cutlets). Serve the dish over mashed potatoes or with a loaf of crusty bread to sop up the earthy sauce. To cut costs, purchase fresh herbs labeled "poultry blend." You'll get an assortment of herbs for the price of one package. Corn muffin mix is a quick and easy substitute to give your casserole a Tamale-like flavor. You'll taste a hint of sweet from the cream-style corn and spice from the chopped green chiles. You'll love this traditional yet low-fat version of Chicken and Broccoli Casserole that's rich, filling, and full of flavor. The main ingredients stay the same: chicken, broccoli, cream of mushroom soup, and Parmesan cheese, but lightened versions take the place of full-fat mayonnaise, whole milk, and heavy cream. 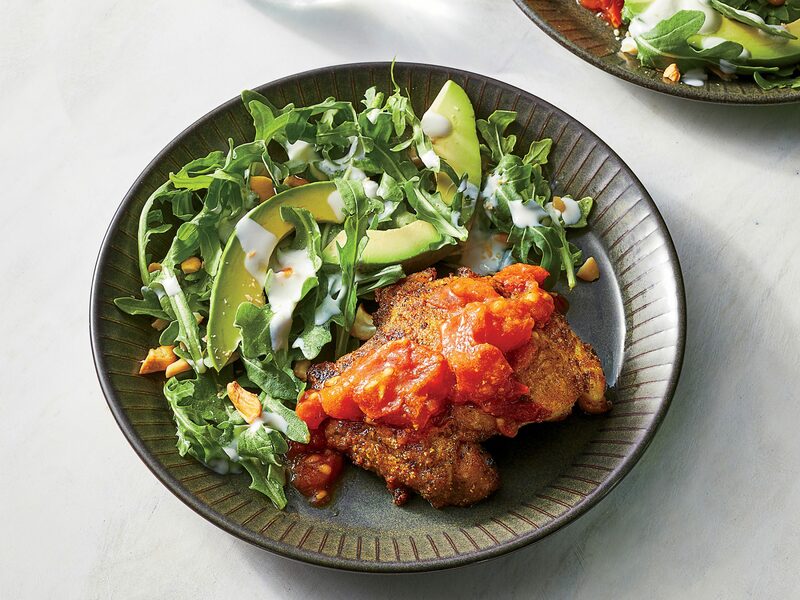 These changes trimmed an impressive 218 calories and almost 30 grams of fat per serving–without sacrificing a bit of flavor! In less than an hour, you can create a one-dish dinner that will satisfy the whole family. A hallmark of Southern cooking, this updated main dish stars Alfredo sauce, prosciutto, and Parmesan cheese. This recipe has a nostalgic appeal that harks back to the 1950s and '60s. If you make it ahead, don't add the baked potato chips until it's time to bake the casserole, or they'll become soggy. Take the traditional casserole up a notch by adding both flavor and nutrition with spinach and shiitake mushrooms. Pair with a simple green salad, and you've got a make-ahead menu for casual entertaining. This Southwestern-inspired casserole incorporates corn tortillas, green chiles, and chicken. You can make-ahead for a large group (the recipe serves 12) or freeze leftovers in single serve containers for weekday lunches. This make-ahead casserole received rave reviews from the MyRecipes family. It may take longer to prepare, but it's worth the wait. See the "Kitchen Express" shortcuts if you're pressed for time. Give chicken thighs Indian flavor by cooking them in a mixture of basmati rice, almonds, golden raisins, yogurt, cinnamon and ginger. Before baking the chicken, you can top the casserole with buttered sheets of phyllo dough. This recipe is easy to mix together and can be frozen for up to one month. Let the kids help out with the crushed cornflake cereal topping.